Defensive Omnivore Bingo: Game on! Please also check out those cards I created myself, including: Defensive Omnivore Bingo 2; Speciesist Feminist Bingo; and Anti-Feminist Vegetarian Bingo. You can also view them all in a big group, via either the “Bingo!” category on easyVegan.info or my Bingo! set on Flickr. The Defensive Omnivore Bingo card has been making the ’rounds for a few weeks now, but naturally I’m just getting around to posting it. As far as I can tell, it originated with History’s Greatest Monster, who seems to be hosting the largest version of the card. In case you’re not familiar with the geeky awesomeness of “[Fill in the blank] Bingo,” it works much like traditional bingo: players must fill in five spots across (up/down, left/right or diagonally) for a win, but instead of numbers, the cheeky faux bingo games utilize common stupid layperson commentary on a given subject (usually an anti-oppression movement, e.g., feminism, LGBT rights, anti-racism, etc.). I rarely ever see bloggers and their readers play, say, “Anti-Feminist Bingo” per se; rather, the fun’s in making and sharing the delightfully snarky cards. Who says vegans/feminists/progressives/etc. don’t have a sense of humor, hmmm? After the jump, I’ve included a text version of the card, for those who can’t view the image. Inspired by similar anti-oppression cards I found online, I’ve also included links to retorts for and debunkings of each insult and/or mythconception. Feel free to share your favorite defensive omnivore clichés in the comments! Explains how they tried vegetarianism once and it didn’t work out. Argues that humans are different than other animals, and therefore eating them is morally justified. Argues that humans are no different than other animals, and therefore eating them…Lions eat zebras, right? Asks what would happen to the cows if we didn’t eat them. Feigns concern. Expresses concern for plant suffering. Preaches to you about how preachy vegans are. Wonders how we’d grow enough food to feed us all if everyone went vegetarian overnight. Bingo! Asks why you care more about animals than human beings. Describes some highly unlikely hypothetical scenario in which you’d be forced to eat meat to survive. Describes the happy farm animal they once saw somewhere. Expresses a completely unrelated concern for starving children somewhere. Something irrelevant about cavemen. Wonders why you don’t make better use of all that time you waste not eating animals. Describes a vegan they once knew who suffered from some random ailment. Concludes it was caused by lack of meat. See also: this lengthy bingo roundup at A Second Thought, complete with textual translations and links to the original graphics. I’ve also favorited quite the collection of Bingo cards on Flickr. Unfortunately, you have to browse through all of my favorites to find them, as Flickr’s Gallery feature only allows for sets of 18 items. Booo! This entry was posted on Wednesday, December 9th, 2009 at 3:06 pm. You can follow any responses to this entry through the RSS 2.0 feed. You can leave a response, or trackback from your own site. Brian VanderVeen is the evil genius who conceived Defensive Omnivore Bingo! He originally posted it to the PPK, but his website is Veganachronism. This is fantastic! All I can say is Bingo! So often, people tell me this ridiculous story about how because we have canine teeth, we must eat meat. I work as a dental nurse, and also have horses. I point out to the omnivores, that horses in fact can grow canine teeth too, and they are larger than the humans- but do they eat meat? No. In fact, our “canine” teeth, are so small that they are of almost no use whatsoever in tearing meat (which is in theory, their purpose). We have incisals for clipping grass and leaves, and flat molars for grinding them. So says someone actually involved in dentistry! Another very frequent one is “you must be low on iron”. I donate blood every 3 months (you can’t go any more frequently than that), and always show a good iron level. That’s more than most omnivores. They claim their blood is more potent and healthy, so why aren’t they in there donating with me? Hmm…. As for the ridiculous claim that if the world went vegan, we would all starve, perhaps those idiotic people should research how much of the world’s human-edible grain and plant matter gets fed to animals in a very wasteful process, to put 1 kilo of meat on their plate. If anything, we will all starve because all the world’s resources were fed to animals, to feed a few rich people who can actually afford meat (because we all know veggies are much cheaper by the kilo!). Love it! 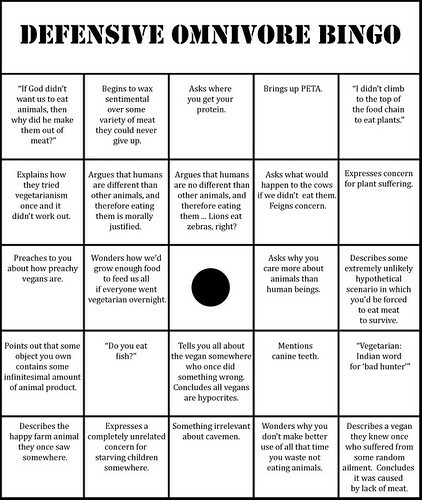 Is there a link to the Defensive Omnivore Bingo Card that has the links. I want to use just that one. Thank you! Awesome bingo card! Just want to point out that the Clueless White Liberal card mocks opponents of factory farming, there are strong similarities between the mass slaughter of humans and non human animals. Peace. Hey, good call. I totally missed that, Marek! It’s fake fur. Fake fur is just really realistic now. Don’t you want fake fur to be good quality? It’s the store’s fault for selling it to me. Real fur is expensive. I could afford this so it must be fake. All the fur in stores is fake nowadays. Wearing fur is free speech! Telling me fur is bad is oppression. It’s a free country. For me to wear fur. Not for you vegetarian organizations to create an animal-friendly space of any kind. Fur-bearing animals would totally bite you given the chance. What if I lived in a place SO COLD that fur was the only way to survive? Do you want the people who skin the animals to lose their jobs? Anyone got any more to complete the Bingo card? My comment preview has random bold text for some reason, so if this comment has random bold parts, sorry!